Today as I was playing with shoulder in with Ivo, my 23 years old black KWPN gelding, some genius in the back of mind remembered me of A’s and O’s. I guess that does not sound familiar, so here’s a little story. At the end of the session all the riders gathered in the dressage arena. Karen asked us to desribe what we had learned that day in max. 5 words. Now usually what happens with such a question is that you start talking … 5 words become 5 sentences … 5 sentences become 5 minutes … and you end up dreaming about it at night! That sounds familiar too??? But this time I did not have to think twice, it came to me in a second: “O in stead of A” was the most valuable lesson that day! Still wondering what that means huh? It’s about the riders legs! 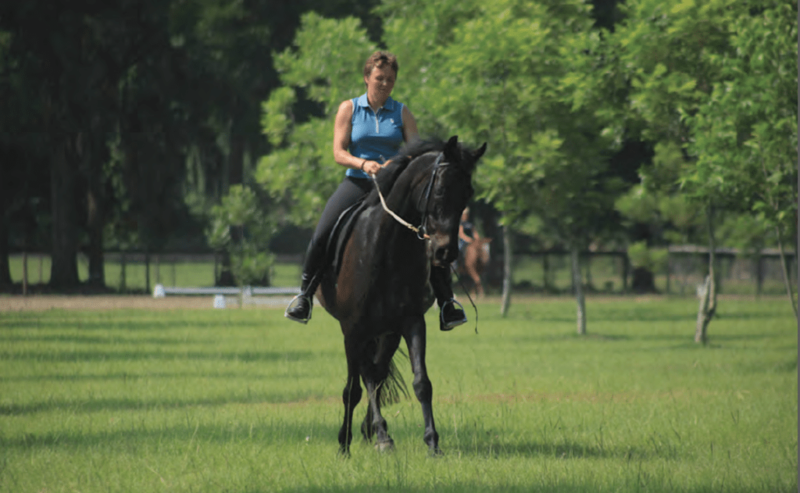 I discovered I could change the position of my legs from A to O, releasing muscles in the upper leg while still feeling my horse with my calves and having enough pressure on the stirrups. This way my seat gave more room for Cocoa’s back and ribs to move, and I could feel the rhythm and suppleness improve. So … try “O in stead of A” sometimes. Being bowlegged can bring you harmony! Disclaimer: don’t blame me or Karen if you end up looking like this!